The abundance of elements in Earth's crust is shown in tabulated form with the estimated crustal abundance for each chemical element shown as parts per million (ppm) by mass. Note that the noble gases are not included, as they form no part of the solid crust. Also not included are certain elements with extremely low crustal concentrations: technetium, promethium (61), and all elements with atomic numbers greater than 83 except thorium (90) and uranium (92). The abundance of the chemical elements is a measure of the occurrence of the chemical elements relative to all other elements in a given environment. Abundance is measured in one of three ways: by the mass-fraction ; by the mole-fraction ; or by the volume-fraction. Volume-fraction is a common abundance measure in mixed gases such as planetary atmospheres, and is similar in value to molecular mole-fraction for gas mixtures at relatively low densities and pressures, and ideal gas mixtures. Most abundance values in this article are given as mass-fractions. The atoms of carbon can bond together in different ways, termed allotropes of carbon. The best known are graphite, diamond, and amorphous carbon. The physical properties of carbon vary widely with the allotropic form. For example, graphite is opaque and black while diamond is highly transparent. 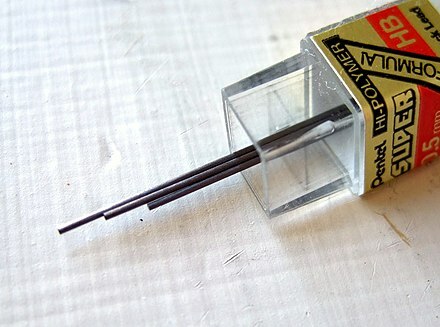 Graphite is soft enough to form a streak on paper (hence its name, from the Greek verb "γράφειν" which means "to write"), while diamond is the hardest naturally occurring material known. Graphite is a good electrical conductor while diamond has a low electrical conductivity. Under normal conditions, diamond, carbon nanotubes, and graphene have the highest thermal conductivities of all known materials. 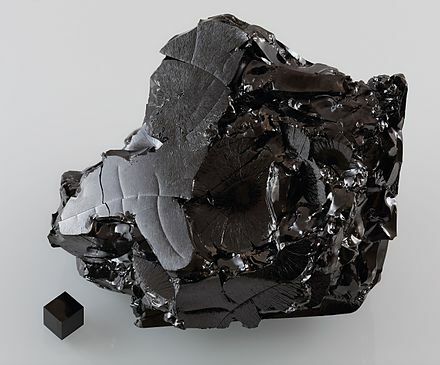 All carbon allotropes are solids under normal conditions, with graphite being the most thermodynamically stable form at standard temperature and pressure. They are chemically resistant and require high temperature to react even with oxygen. Carbon is capable of forming many allotropes due to its valency. Well-known forms of carbon include diamond and graphite. In recent decades many more allotropes, or forms of carbon, have been discovered and researched including ball shapes such as buckminsterfullerene and sheets such as graphene. 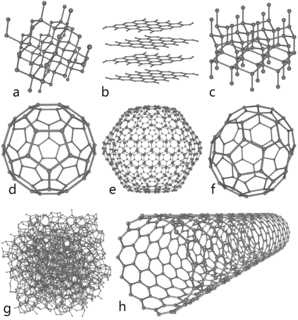 Larger scale structures of carbon include nanotubes, nanobuds and nanoribbons. Other unusual forms of carbon exist at very high temperatures or extreme pressures. Around 500 hypothetical 3-periodic allotropes of carbon are known at the present time according to SACADA database. Graphite, archaically referred to as plumbago, is a crystalline form of the element carbon with its atoms arranged in a hexagonal structure. 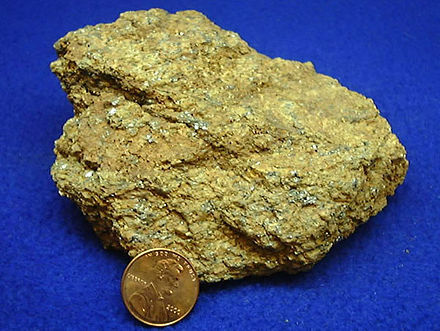 It occurs naturally in this form and is the most stable form of carbon under standard conditions. Under high pressures and temperatures it converts to diamond. 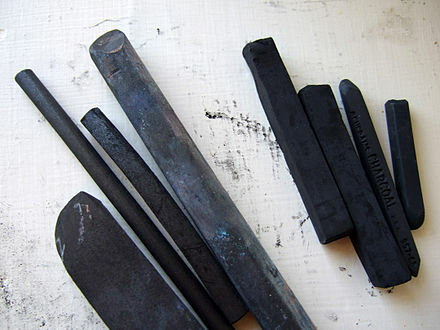 Graphite is used in pencils and lubricants. Its high conductivity makes it useful in electronic products such as electrodes, batteries, and solar panels. Graphite is a very good lubricant, displaying superlubricity. Diamond is the ultimate abrasive. Graphite is a conductor of electricity. 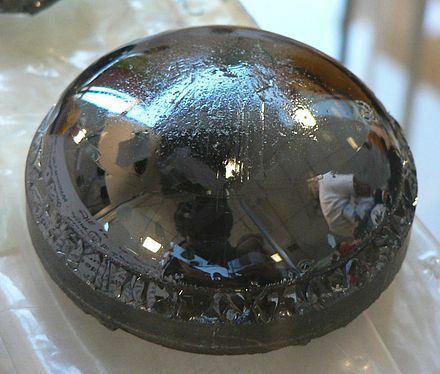 Diamond is an excellent electrical insulator,  and has the highest breakdown electric field of any known material. Graphite crystallizes in the hexagonal system. Diamond crystallizes in the cubic system. The amorphous form is an assortment of carbon atoms in a non-crystalline, irregular, glassy state, not held in a crystalline macrostructure. It is present as a powder, and is the main constituent of substances such as charcoal, lampblack (soot) and activated carbon. At normal pressures, carbon takes the form of graphite, in which each atom is bonded trigonally to three others in a plane composed of fused hexagonal rings, just like those in aromatic hydrocarbons. The resulting network is 2-dimensional, and the resulting flat sheets are stacked and loosely bonded through weak van der Waals forces. This gives graphite its softness and its cleaving properties (the sheets slip easily past one another). Because of the delocalization of one of the outer electrons of each atom to form a π-cloud, graphite conducts electricity, but only in the plane of each covalently bonded sheet. This results in a lower bulk electrical conductivity for carbon than for most metals. The delocalization also accounts for the energetic stability of graphite over diamond at room temperature. It has been estimated that the solid earth as a whole contains 730 ppm of carbon, with 2000 ppm in the core and 120 ppm in the combined mantle and crust. Since the mass of the earth is 7024597200000000000♠5.972×1024 kg, this would imply 4360 million gigatonnes of carbon. 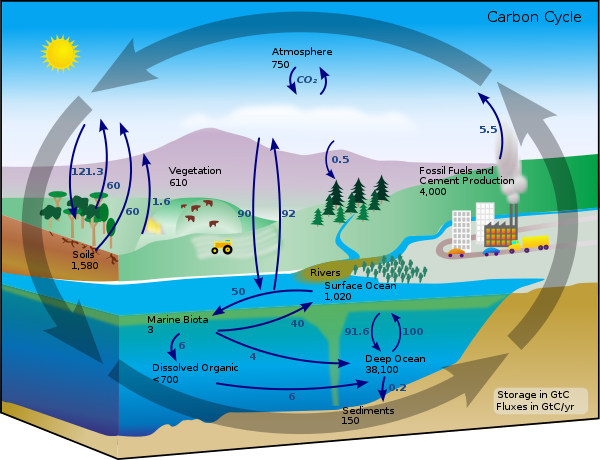 This is much more than the amount of carbon in the oceans or atmosphere (below). Isotopes of carbon are atomic nuclei that contain six protons plus a number of neutrons (varying from 2 to 16). Carbon has two stable, naturally occurring isotopes. The isotope carbon-12 (12C) forms 98.93% of the carbon on Earth, while carbon-13 (13C) forms the remaining 1.07%. The concentration of 12C is further increased in biological materials because biochemical reactions discriminate against 13C. In 1961, the International Union of Pure and Applied Chemistry (IUPAC) adopted the isotope carbon-12 as the basis for atomic weights. Identification of carbon in nuclear magnetic resonance (NMR) experiments is done with the isotope 13C. Formation of the carbon atomic nucleus occurs within a giant or supergiant star through the triple-alpha process. This requires a nearly simultaneous collision of three alpha particles (helium nuclei), as the products of further nuclear fusion reactions of helium with hydrogen or another helium nucleus produce lithium-5 and beryllium-8 respectively, both of which are highly unstable and decay almost instantly back into smaller nuclei. The triple-alpha process happens in conditions of temperatures over 100 megakelvins and helium concentration that the rapid expansion and cooling of the early universe prohibited, and therefore no significant carbon was created during the Big Bang. According to current physical cosmology theory, carbon is formed in the interiors of stars on the horizontal branch. When massive stars die as supernova, the carbon is scattered into space as dust. This dust becomes component material for the formation of the next-generation star systems with accreted planets. The Solar System is one such star system with an abundance of carbon, enabling the existence of life as we know it. 2),  the unstable dicarbon monoxide (C2O),   carbon trioxide (CO3),   cyclopentanepentone (C5O5),  cyclohexanehexone (C6O6),  and mellitic anhydride (C12O9). However, mellitic anhydride is the triple acyl anhydride of mellitic acid; moreover, it contains a benzene ring. Thus, many chemists consider it to be organic. It is important to note that in the cases above, each of the bonds to carbon contain less than two formal electron pairs, making them hypercoordinate, but not hypervalent. Even in cases of alleged 10-C-5 species (that is, a carbon with five ligands and a formal electron count of ten), as reported by Akiba and co-workers,  electronic structure calculations conclude that the total number of electrons around carbon is still less than eight, as in the case of other compounds described by three-center bonding. The English name carbon comes from the Latin carbo for coal and charcoal,  whence also comes the French charbon, meaning charcoal. In German, Dutch and Danish, the names for carbon are Kohlenstoff, koolstof and kulstof respectively, all literally meaning coal-substance. Today, most commercially viable diamond deposits are in Russia, Botswana, Australia and the Democratic Republic of Congo. In 2005, Russia produced almost one-fifth of the global diamond output, reports the British Geological Survey. Australia has the richest diamantiferous pipe with production reaching peak levels of 42 metric tons (41 long tons; 46 short tons) per year in the 1990s. There are also commercial deposits being actively mined in the Northwest Territories of Canada, Siberia (mostly in Yakutia territory; for example, Mir pipe and Udachnaya pipe), Brazil, and in Northern and Western Australia. Pure carbon has extremely low toxicity to humans and can be handled and even ingested safely in the form of graphite or charcoal. [ citation needed ] It is resistant to dissolution or chemical attack, even in the acidic contents of the digestive tract. Consequently, once it enters into the body's tissues it is likely to remain there indefinitely. Carbon black was probably one of the first pigments to be used for tattooing, and Ötzi the Iceman was found to have carbon tattoos that survived during his life and for 5200 years after his death. 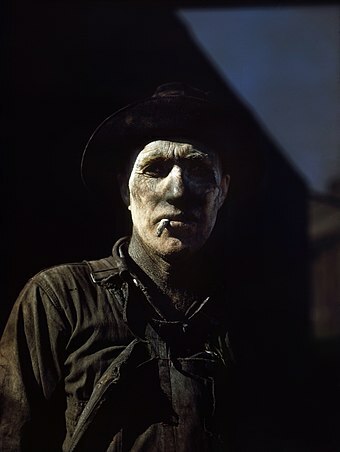 Inhalation of coal dust or soot (carbon black) in large quantities can be dangerous, irritating lung tissues and causing the congestive lung disease, coalworker's pneumoconiosis. Diamond dust used as an abrasive can be harmful if ingested or inhaled. Microparticles of carbon are produced in diesel engine exhaust fumes, and may accumulate in the lungs. In these examples, the harm may result from contaminants (e.g., organic chemicals, heavy metals) rather than from the carbon itself. 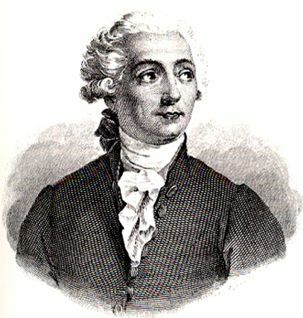 Carbon may burn vigorously and brightly in the presence of air at high temperatures. Large accumulations of coal, which have remained inert for hundreds of millions of years in the absence of oxygen, may spontaneously combust when exposed to air in coal mine waste tips, ship cargo holds and coal bunkers,   and storage dumps. 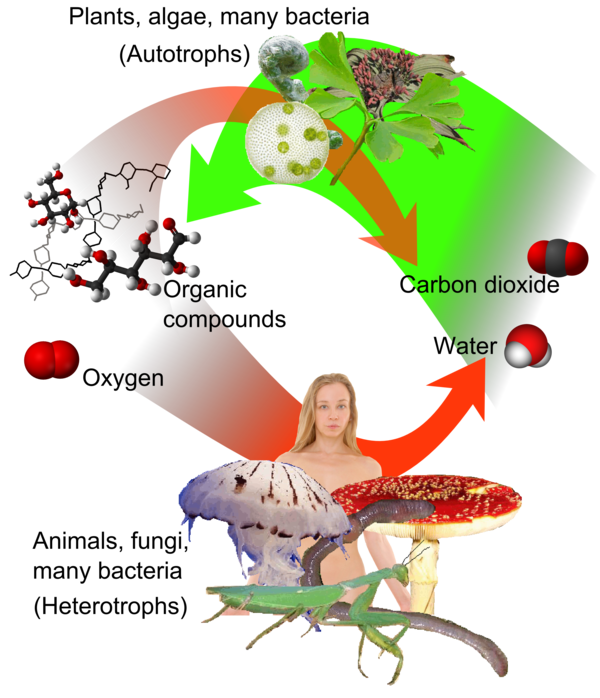 The great variety of carbon compounds include such lethal poisons as tetrodotoxin, the lectin ricin from seeds of the castor oil plant Ricinus communis , cyanide (CN−), and carbon monoxide; and such essentials to life as glucose and protein. Boron nitride is a heat and chemically resistant refractory compound of boron and nitrogen with the chemical formula BN. It exists in various crystalline forms that are isoelectronic to a similarly structured carbon lattice. The hexagonal form corresponding to graphite is the most stable and soft among BN polymorphs, and is therefore used as a lubricant and an additive to cosmetic products. 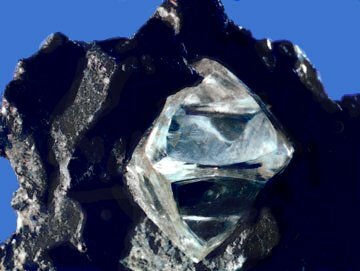 The cubic variety analogous to diamond is called c-BN; it is softer than diamond, but its thermal and chemical stability is superior. The rare wurtzite BN modification is similar to lonsdaleite and may even be harder than the cubic form. 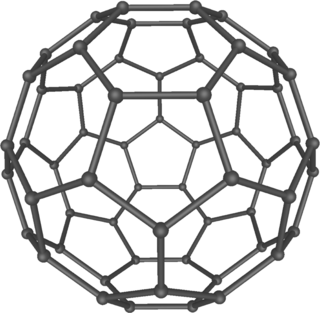 A fullerene is an allotrope of carbon whose molecule consists of carbon atoms connected by single and double bonds so as to form a closed or partially closed mesh, with fused rings of five to seven atoms. The molecule may be a hollow sphere, ellipsoid, tube, or many other shapes and sizes. Graphene, which is a flat mesh of regular hexagonal rings, can be seen as an extreme member of the family. A period 2 element is one of the chemical elements in the second row of the periodic table of the chemical elements. The periodic table is laid out in rows to illustrate recurring (periodic) trends in the chemical behavior of the elements as their atomic number increases; a new row is started when chemical behavior begins to repeat, creating columns of elements with similar properties. In chemistry, pi bonds are covalent chemical bonds where two lobes of an orbital on one atom overlap two lobes of an orbital on another atom and this overlap occurs laterally. Each of these atomic orbitals has zero electron density at a shared nodal plane, passing through the two bonded nuclei. The same plane is also a nodal plane for the molecular orbital of the pi bond. In chemistry, delocalized electrons are electrons in a molecule, ion or solid metal that are not associated with a single atom or a covalent bond. The term is general and can have slightly different meanings in different fields. In organic chemistry, this refers to resonance in conjugated systems and aromatic compounds. In solid-state physics, this refers to free electrons that facilitate electrical conduction. In quantum chemistry, this refers to molecular orbital electrons that extend over several adjacent atoms. 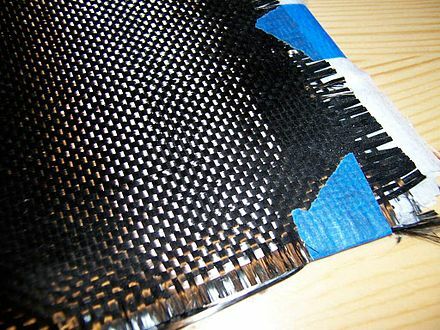 Amorphous carbon is free, reactive carbon that does not have any crystalline structure. Amorphous carbon materials may be stabilized by terminating dangling-π bonds with hydrogen. As with other amorphous solids, some short-range order can be observed. Amorphous carbon is often abbreviated to aC for general amorphous carbon, aC:H or HAC for hydrogenated amorphous carbon, or to ta-C for tetrahedral amorphous carbon. Carbon monofluoride, also called polycarbon monofluoride (PMF), polycarbon fluoride, poly(carbon monofluoride), and graphite fluoride, is a material formed by high-temperature reaction of fluorine gas with graphite, charcoal, or pyrolytic carbon powder. It is a highly hydrophobic microcrystalline powder. Its CAS number is 51311-17-2. In contrast to graphite intercalation compounds it is a covalent graphite compound. In chemistry, crystallography, and materials science the 'coordination number', also called ligancy, of a central atom in a molecule or crystal is the number of atoms, molecules or ions bonded to it. The ion/molecule/atom surrounding the central ion/molecule/atom is called a ligand. This number is determined somewhat differently for molecules than for crystals. A network solid or covalent network solid is a chemical compound in which the atoms are bonded by covalent bonds in a continuous network extending throughout the material. In a network solid there are no individual molecules, and the entire crystal or amorphous solid may be considered a macromolecule. Formulas for network solids, like those for ionic compounds, are simple ratios of the component atoms represented by a formula unit. A cubane-type cluster is an arrangement of atoms in a molecular structure that forms a cube. In the idealized case, the eight vertices are symmetry equivalent and the species has Oh symmetry. Such a structure is illustrated by the hydrocarbon cubane. With chemical formula C8H8, cubane has carbon atoms at the corners of a cube and covalent bonds forming the edges. Most cubanes have more complicated structures, usually with nonequivalent vertices. They may be simple covalent compounds or macromolecular or supramolecular cluster compounds. ↑ "Carbon: Binary compounds" . Retrieved 2007-12-06. ↑ Deming, Anna (2010). "King of the elements?". Nanotechnology. 21 (30): 300201. Bibcode:2010Nanot..21D0201D. doi:10.1088/0957-4484/21/30/300201. PMID 20664156. ↑ Dienwiebel, Martin; Verhoeven, Gertjan; Pradeep, Namboodiri; Frenken, Joost; Heimberg, Jennifer; Zandbergen, Henny (2004). "Superlubricity of Graphite" (PDF). Physical Review Letters. 92 (12): 126101. Bibcode:2004PhRvL..92l6101D. doi:10.1103/PhysRevLett.92.126101. PMID 15089689. Archived (PDF) from the original on 2011-09-17. ↑ Deprez, N.; McLachan, D. S. (1988). "The analysis of the electrical conductivity of graphite conductivity of graphite powders during compaction". Journal of Physics D: Applied Physics . 21 (1): 101–107. Bibcode:1988JPhD...21..101D. doi:10.1088/0022-3727/21/1/015. ↑ Collins, A. T. (1993). "The Optical and Electronic Properties of Semiconducting Diamond". Philosophical Transactions of the Royal Society A . 342 (1664): 233–244. Bibcode:1993RSPTA.342..233C. doi:10.1098/rsta.1993.0017. 1 2 Dresselhaus, M. S.; Dresselhaus, G.; Avouris, Ph., eds. (2001). Carbon nanotubes: synthesis, structures, properties and applications. Topics in Applied Physics. 80. Berlin. ISBN 978-3-540-41086-7. ↑ Nasibulin, A.; Anisimov, Anton S.; Pikhitsa, Peter V.; Jiang, Hua; Brown, David P.; Choi, Mansoo; Kauppinen, Esko I. (2007). "Investigations of NanoBud formation". Chemical Physics Letters. 446 (1): 109–114. Bibcode:2007CPL...446..109N. doi:10.1016/j.cplett.2007.08.050. ↑ Vieira, R; Ledoux, Marc-Jacques; Pham-Huu, Cuong (2004). "Synthesis and characterisation of carbon nanofibers with macroscopic shaping formed by catalytic decomposition of C2H6/H2 over nickel catalyst". Applied Catalysis A: General. 274 (1–2): 1–8. doi:10.1016/j.apcata.2004.04.008. 1 2 3 Harris, PJF (2004). "Fullerene-related structure of commercial glassy carbons" (PDF). Philosophical Magazine. 84 (29): 3159–3167. Bibcode:2004PMag...84.3159H. CiteSeerX 10.1.1.359.5715 . doi:10.1080/14786430410001720363. Archived from the original (PDF) on 2012-03-19. Retrieved 2011-07-06. ↑ Rossini, F. D.; Jessup, R. S. (1938). "Heat and Free Energy of Formation of Carbon Dioxide and of the Transition Between Graphite and Diamond". Journal of Research of the National Bureau of Standards. 21 (4): 491. doi:10.6028/jres.021.028. ↑ Grochala, Wojciech (2014-04-01). "Diamond: Electronic Ground State of Carbon at Temperatures Approaching 0 K". Angewandte Chemie International Edition. 53 (14): 3680–3683. doi:10.1002/anie.201400131. ISSN 1521-3773. PMID 24615828. ↑ "Researchers Find New Phase of Carbon, Make Diamond at Room Temperature". news.ncsu.edu. 2015-11-30. Archived from the original on 2016-04-06. Retrieved 2016-04-06. 1 2 3 Hoover, Rachel (21 February 2014). "Need to Track Organic Nano-Particles Across the Universe? NASA's Got an App for That". NASA . Archived from the original on 6 September 2015. Retrieved 2014-02-22. ↑ William F McDonough The composition of the Earth Archived 2011-09-28 at the Wayback Machine in Majewski, Eugeniusz (2000). Earthquake Thermodynamics and Phase Transformation in the Earth's Interior. ISBN 978-0126851854. ↑ Fred Pearce (2014-02-15). "Fire in the hole: After fracking comes coal". New Scientist : 36–41. Archived from the original on 2015-03-16. ↑ "Wonderfuel: Welcome to the age of unconventional gas" Archived 2014-12-09 at the Wayback Machine by Helen Knight, New Scientist , 12 June 2010, pp. 44–7. 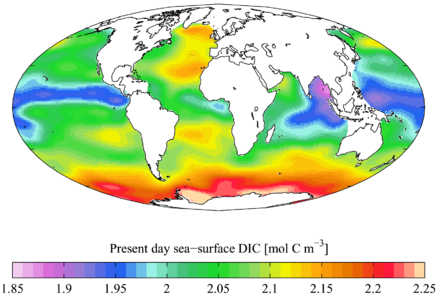 ↑ Ocean methane stocks 'overstated' Archived 2013-04-25 at the Wayback Machine , BBC, 17 Feb. 2004. ↑ "Ice on fire: The next fossil fuel" Archived 2015-02-22 at the Wayback Machine by Fred Pearce, New Scientist, 27 June 2009, pp. 30–33. ↑ Calculated from file global.1751_2008.csv in "Index of /ftp/ndp030/CSV-FILES". Archived from the original on 2011-10-22. Retrieved 2011-11-06. from the Carbon Dioxide Information Analysis Center. ↑ Audi, Georges; Bersillon, Olivier; Blachot, Jean; Wapstra, Aaldert Hendrik (1997). "The NUBASE evaluation of nuclear and decay properties" (PDF). Nuclear Physics A. 624 (1): 1–124. Bibcode:1997NuPhA.624....1A. doi:10.1016/S0375-9474(97)00482-X. Archived from the original (PDF) on 2008-09-23. ↑ Ostlie, Dale A. & Carroll, Bradley W. (2007). An Introduction to Modern Stellar Astrophysics. San Francisco (CA): Addison Wesley. ISBN 978-0-8053-0348-3. ↑ Whittet, Douglas C. B. (2003). Dust in the Galactic Environment. CRC Press. pp. 45–46. ISBN 978-0-7503-0624-9. ↑ Pikelʹner, Solomon Borisovich (1977). Star Formation. 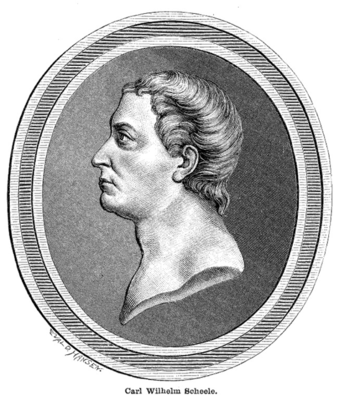 Springer. p. 38. ISBN 978-90-277-0796-3. Archived from the original on 2012-11-23. Retrieved 2011-06-06. ↑ Smith, T. M.; Cramer, W. P.; Dixon, R. K.; Leemans, R.; Neilson, R. P.; Solomon, A. M. (1993). "The global terrestrial carbon cycle". Water, Air, & Soil Pollution. 70 (1–4): 19–37. Bibcode:1993WASP...70...19S. doi:10.1007/BF01104986. ↑ Haldane J. (1895). "The action of carbonic oxide on man". Journal of Physiology. 18 (5–6): 430–462. doi:10.1113/jphysiol.1895.sp000578. PMC 1514663 . PMID 16992272. ↑ Bayes, K. (1961). "Photolysis of Carbon Suboxide". Journal of the American Chemical Society . 83 (17): 3712–3713. doi:10.1021/ja01478a033. ↑ Anderson D. J.; Rosenfeld, R. N. (1991). "Photodissociation of Carbon Suboxide". Journal of Chemical Physics . 94 (12): 7852–7867. Bibcode:1991JChPh..94.7857A. doi:10.1063/1.460121. ↑ Sabin, J. R.; Kim, H. (1971). "A theoretical study of the structure and properties of carbon trioxide". Chemical Physics Letters . 11 (5): 593–597. Bibcode:1971CPL....11..593S. doi:10.1016/0009-2614(71)87010-0. ↑ Yamashita, Makoto; Yamamoto, Yohsuke; Akiba, Kin-ya; Hashizume, Daisuke; Iwasaki, Fujiko; Takagi, Nozomi; Nagase, Shigeru (2005-03-01). "Syntheses and Structures of Hypervalent Pentacoordinate Carbon and Boron Compounds Bearing an Anthracene Skeleton − Elucidation of Hypervalent Interaction Based on X-ray Analysis and DFT Calculation". Journal of the American Chemical Society. 127 (12): 4354–4371. doi:10.1021/ja0438011. ISSN 0002-7863. PMID 15783218. ↑ Donaldson, K.; Stone, V.; Clouter, A.; Renwick, L.; MacNee, W. (2001). "Ultrafine particles". Occupational and Environmental Medicine. 58 (3): 211–216. doi:10.1136/oem.58.3.211. PMC 1740105 . PMID 11171936. Archived from the original on 2009-05-01.